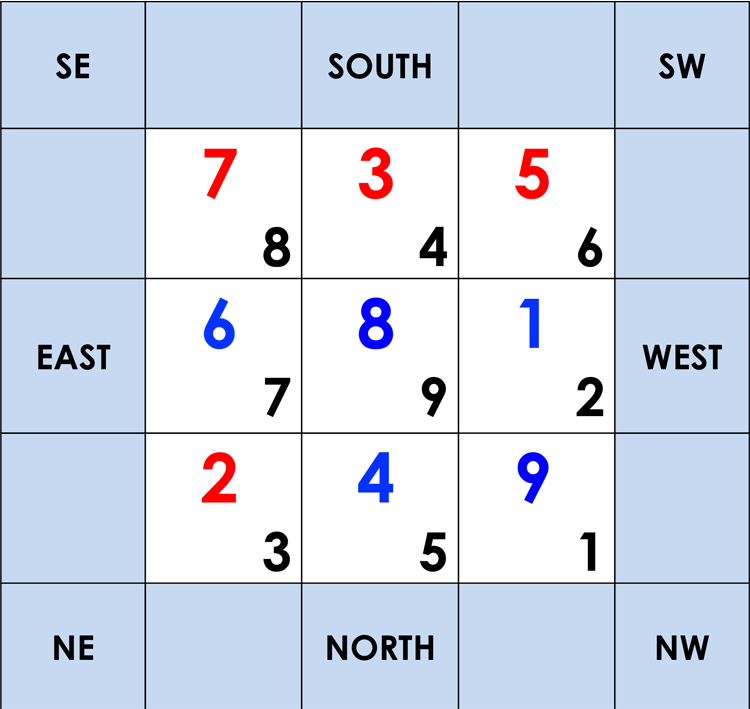 The Flying Star chart below shows 9 fields, each containing two numbers. The number on the upper left represents the annual star (red = afflictive, blue = auspicious) and the black number in the bottom right represents the current monthly star. These are the numbers (stars) that change every month and create new energy patterns in your home and office. To apply these monthly stars successfully, you need to map out the compass sectors in your home or office. If you are not yet familiar with the compass orientations of your home, I recommend you take two compass readings: one from your main door, looking out, and another reading from the center of your living room, looking towards your balcony or picture window. These two readings should enable you to determine the compass directions and locations of your home. Then you are in a position to allocate the stars (numbers) into the correct areas. Please take particular note of the location of your main entrance door and your master bedroom, as the stars in those sectors will affect you the most. Good fortune and prosperity luck flies into the SE this month! That is excellent news as the No 8 Star promises enhanced money luck, which could even come in the form of a windfall of some kind. Use this part of your home as much as possible this month to benefit from the auspicious chi. To activate, you can place a Wealth Ship loaded with treasures and gold ingots or a Wealth Bowl in your SE. Carrying a Treasure Chest amulet or a Golden Pineapple will also help to attract the prosperity chi. Young people will enjoy improved romance luck. If you wish to enhance this, display a Peach Blossom Music Tree in your SE. The SOUTH will be a good area this month for students to spend their time studying thanks to the No 4 Star flying in. A Crystal Point will help memorize and a Bejewelled Wisdom Pagoda on your desk will boost exam luck. Students can also carry a Scholastic Success amulet. Authors and those in literary professions (eg media, copy writers) will find the words flow easily, especially if their work station is in the SOUTH. However, there is excessive wood energy, which could lead to serious relationship problems between family members. There is also the possibility of third party entering your relationship, causing a romantic scandal. Be aware of predatory outsiders who use flattery to get close to you or your partner. If this is a concern, place an Amethyst Geode with Red String under your bed or carry the Marriage Saver Medallion to protect your marriage/relationship. The luck of the SW improves enormously this month thanks to the No 6 Heaven Star bringing unexpected windfalls and speculative luck. This is another area where you should spend a lot of time! In addition, you can enhance the favourable feng shui winds by placing a Stupa of 8 Doors to Abundance in your SW, or simply 6 Chinese coins tied with a red ribbon. Having said that, there is also danger of mental stress and frustration caused by health problems. It would be good to carry the Anti-Illness amulet to protect yourself from falling ill, especially if you are born in the Years of the Sheep or Monkey. Matriarchs and those with bedrooms in the SW need to look out for their health too. At the same time, those mentioned above can boost their personal good fortune luck with a 9 Tailed Red Fox amulet. The monthly No 7 Star brings serious danger of theft and violence. Please make sure to place an Anti-Robbery Plaque or an Anti-Burglary lumi tile here (and attach Anti-Burglary Stickers to your EAST windows) and if your main entrance door is in the EAST, you might like to add a Red-faced Kuan Kung for added protection. Those with bedrooms or offices in the EAST ought to be particularly careful – avoid staying out too late, be aware of betrayal and don’t put yourself at unnecessary risk. Do carry an Anti-Burglary amulet when you are out. The No 9 Star multiplies the existing wealth luck in the Centre, which is fabulous news! Prosperity luck will be greatly enhanced, especially for those living in homes with an open plan concept. Look out for good news coming your way! It would be a shame not to enhance your Centre area this month. Spend time in this part of your home, host a party to bring valuable yang energy to the Centre area. Light incense or scented candles and add red accessories. The colour red is particularly potent here because it is the colour that represents wealth this year. A bright light and/or 9 Chinese Coins tied with a red string will work magic too. Those staying in the WEST need to look after their health as the monthly Illness Star is flying in. Place a metal Wu Lou on your bedside table for protection. A Bejewelled Lucky Tortoise can also enhance your health luck and aid good sleep. Please be very careful as there is also the danger of marital problems and miscarriage. Hang the Garuda windchime in the WEST of your home or in the WEST of your living room to protect against sickness and accidents. Those who have an office in the WEST can display the Key of Success & Victory on their desk (or carry the amulet) to boost the positive energy of the annual No 1 Victory Star. The NE is a very unfortunate sector this month due to the quarrelsome No 3 Star joining the annual Illness Star. This combination can bring serious money problems. Display a pair of Red and Gold Apples in this area to calm the energy. The elements of the two stars clash, bringing tension and stress to marriages and close relationships. Displaying the God of Marriage or the Double Happiness Symbol will help to smooth your relationship with your spouse. Keep this area as quiet as possible and remove any windchimes you might have hanging here. Use fire energy in the form of red accessories to counter the conflict energies brought by the No 3 Star. The monthly Misfortune Star brings bad luck and financial losses, especially to those staying in the NORTH. The best cure is to place a Tri-Coloured 5 Element Pagoda in your NORTH and keep this area as quiet as possible. Avoid playing loud music, digging or drilling or slamming doors. The bad luck brought by the Misfortune Star can also include physical harm and injuries, hence those staying in the NORTH are advised to carry an Anti-Illness amulet. Elderly people should sleep in a different bedroom this month as they are particularly susceptible to the negative energy. The NW is one of the luckiest sectors this month with the two stars forming a sum-of-ten, bringing strong completion luck, promotion luck at work, new clients for young businesses, and fame luck to those in the show business. If you are an ambitious person, do make the best of this opportunity! To enhance career prospects, you can display a Bamboo Forest of Prosperity in your NW. 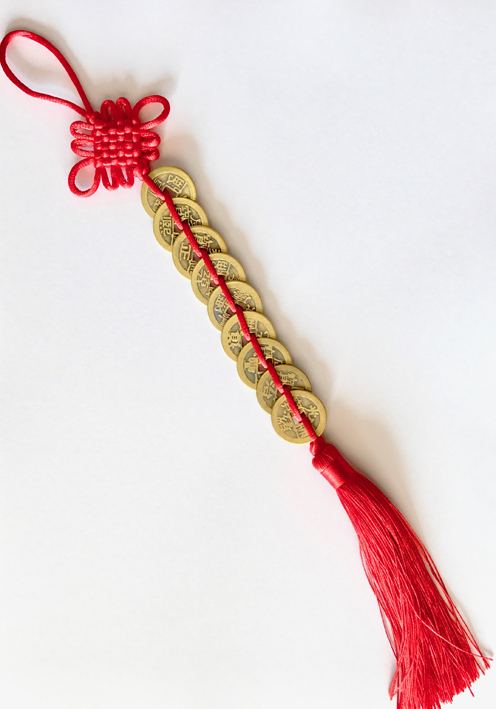 To enhance overall good fortune, you can hang a “Year of the Pig” print in your NW and/or carry a Sum-of-Ten amulet. Those born in the Years of the Dog or Pig and those staying in the NW will enjoy the vibes of successful transformation – making this an excellent time to change their direction or pursue a new venture.